All VM replicas that you want to verify are located on the same ESX(i) host. VM replicas you want to verify are connected to different networks. 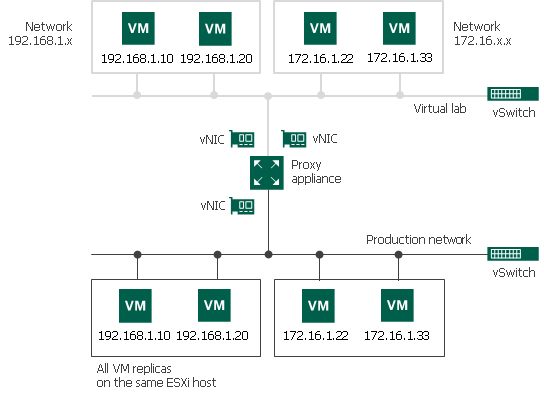 For this configuration type, the virtual lab must be created on the same ESX(i) host where VMs replicas are located. If you create the virtual lab on some other ESX(i) host, the SureBackup job will fail. In the advanced single-host virtual lab, Veeam Backup & Replication creates several virtual networks. The number of virtual networks corresponds to the number of production networks to which verified VM replicas are connected. Networks in the virtual lab are mapped to corresponding production networks.